March 22 was our first official day in Hong Kong! 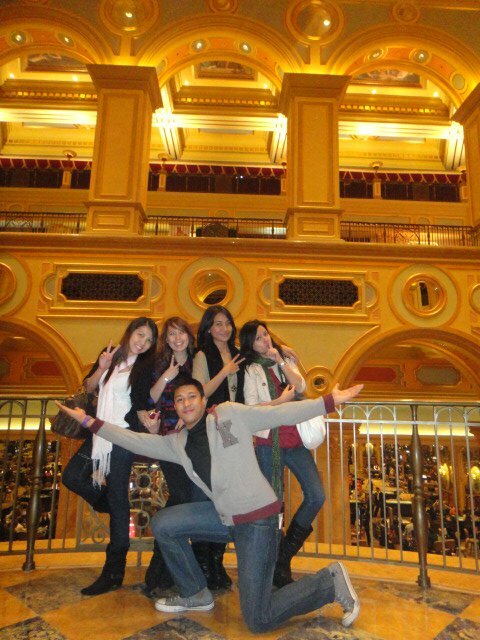 And ironically, it was spent in Macau. haha! After breakfast, we took the train from Tung Chung Station to HK-Central. And again, I wasn't properly dressed! 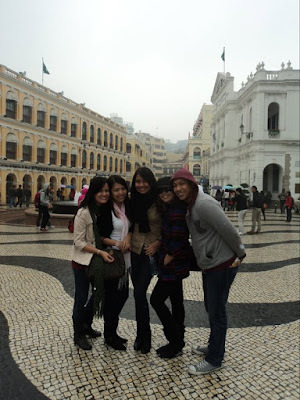 There we were, getting lost around HK-Central trying to find the ferry boat to Macau while braving the "less than 10 degrees" temperature wearing "normal day clothes"! Oh, not to mention, with some drizzles of rain! Wah! And finally, we found our way to Shuen Wan, where all the ferry boats to Macau were. We rode the TurboJet and it took us only an hour to get to Macau. Our passports got stamped again since we're already in a different country. Cool! :)) And if only we knew that we could go to Shen Zen from there, we could have gotten another stamp. and that's for China! Way cooler! haha! So when we got down at the port of Macau, we immediately grabbed maps. We tried figuring out where to go. 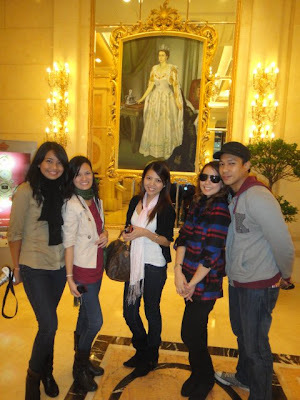 There were a lot of Filipinos there who were acting as tour guides. We were offered a good rate for a whole-day city tour so we accepted it. Good thing the city tour bus rides within the city were free. Our first stop was Jackie Chan's Hotel. I forgot the details but it had guards (that looked like those in the Buckingham Palace) on its entrance doors. And the floors we were stepping on got gold bars underneath! The whole lobby's in gold! Since it;s already lunch time and we were too hungry, our tour guide took us to the building beside the hotel. We ate in a food court where you'll take note of the Reference Number of your meal of choice at any stall then pay in one common counter. But it was so weird that we didn't find any bottled water in the place. We even had to buy it from 7-eleven. Then we walked going to the Ruins. It's quite rainy so it's really cold! But it was a fun walk 'coz of the nice views we were seeing while walking. Then we walked to the bus stop going to the City of Dreams. But on our way there, we had a fashion emergency! When we got to the City of Dreams, we got tickets to the free show. 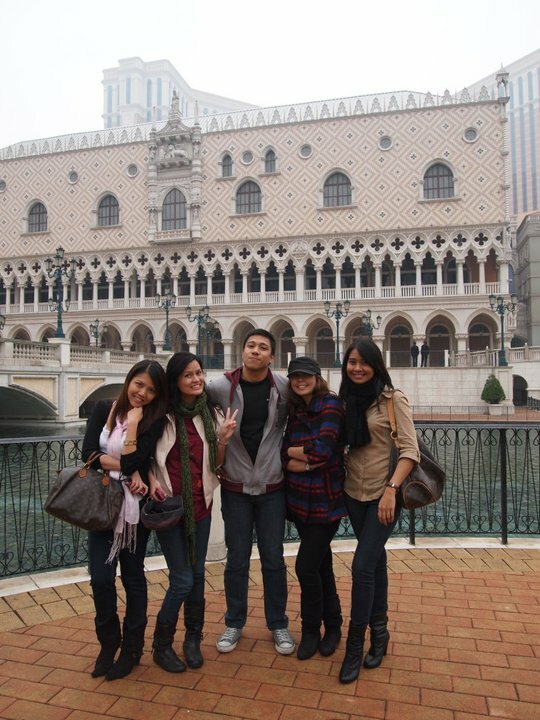 While waiting for the show time, we crossed the street and went to The Venetian first. We passed through the casino, window-shopped in some stores, and took photos at the "Venice-like" set-up. 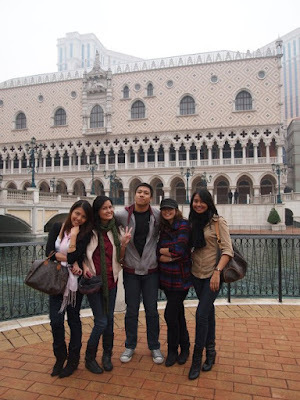 After the quick tour inside The Venetian, we went back to the City of Dreams/ We finally lined up for the show. We were just standing inside a dome-shaped hall without any idea of what's gonna happen 'til the show started! Gosh, the entire place was like a dome-shaped screen! everything happened above and around us! It was the first of its kind that I've ever seen. Luckily, I was able to record everything on video; however, it made my back, neck, arms, and legs hurt. haha! The whole day involved a lot of walking. Believe me, it felt like I lost a lot of calories because of that exercise! haha! Plus having survived 7 degrees wearing only a cotton tank top, cardigan, jeans, and boots, was actually crazy! Good thing I got exposed to "below zero degrees" for quite some time in my Spring trip in Japan months ago so my body wasn't shocked on that day's temperature.